This couple had a perfectly lovely photo, albeit a bit off-center. Given the general public’s varying opinions on PDA, we’d like to assume this couple respectfully waited until their seatmates were out of sight before taking this pre-smooch snap. Either way, the couple was photographed sitting in sardine-like style as if to make room for others. 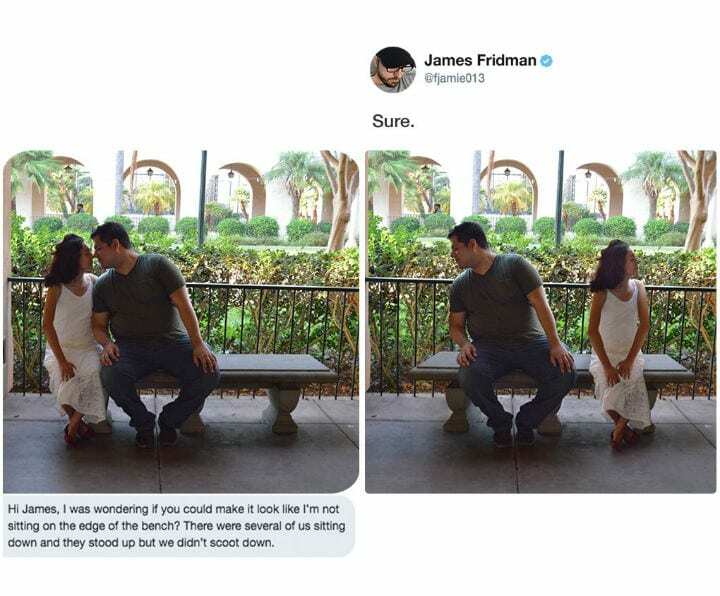 So they appealed to master photo manipulator James Fridman. James used his signature Photoshop skills to literally accomplish this woman’s request to edit the shot and place her and her beau further down the bench. Well, she should have been a little more specific. No longer a couple about to kiss, these two might as well be strangers, as they look off in opposite directions. But hey, at least the bench is being used to its full seating potential, right? And isn’t that what she wanted after all?